Muscle is basically made up of protein and protein is a product of amino acids. Laminine contains 22 full chain of these amino acids or protein which provides the body the material needed for muscle tissue repair. When we get muscle or tissue injury, dormant stem cells in the body begin to activate itself in order to repair damaged cell or tissue. When the damage is severe, our body has difficulties in ‘repairing itself’. More so if we have an inadequate supply of amino acids. Laminine does not only provide the material or protein the body needs but also help activate the dormant stem cell to do its job quicker and more efficiently. These amino acids chain form itself into specialized proteins that a particular muscle need, thus Laminine provides the material our body needs to repair itself. It does more than providing the material as Fibroblast Growth Factor or FGF (contained in the Fertilized Avian Egg) is medically known to promote proliferation of damaged or aging cells. 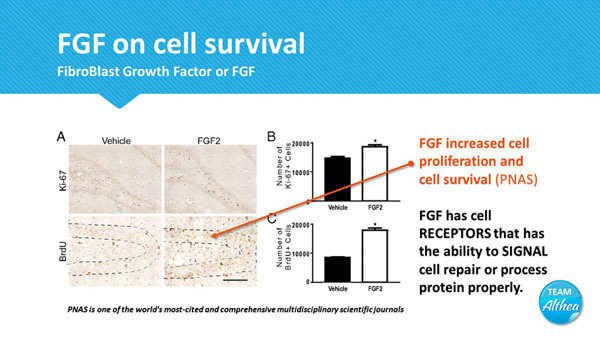 FGF has cell receptors that have the ability to signal cell or muscle repair and process the protein properly to aid with faster recovery and complete healing as needed. OPT9 another ingredient found in the list of benefits of Laminine is combined with creatine reinforce each other. The result of this combination is improved performance, decreased fatigue, and a reduced risk of energy depletion in the muscles. A double-blind trial on the use of PESE conducted at the University of Colorado showed that the group using it experienced a strong increase that was nearly double that of the group using creatinine. PESE and creatinine together were found to outperform creatinine and other food supplements in the areas of endurance, training, motivation, and subjective health and well-being, and it has the enthusiastic endorsement of many top athletes. They report recovering faster after training. This is linked to a substantial reduction in lactic acid production, which also contributes to increased stamina. But what does creatinine have to do with OPT9? It appears that creatinine and the egg protein fractions that are found in OPT9 reinforce each other, resulting in a prominent increase in effectiveness. This means that bodybuilders and athletes experience greatly enhanced benefits when adding Laminine to their regimen. No wonder the product has the enthusiastic endorsement of so many professional athletes and bodybuilders. Laminine combines the two ingredients Leucine and Isoleucine (known as branched chain amino acids) from the PESE with an added dose from the vegetable protein extract. Leucine and Isoleucine provide ingredients for the manufacturing of other essential biochemical components in the body, some of which are utilized for the production of energy, stimulants to the upper brain and helping you to be more alert.